The day Steve Jobs held his new creation aloft I, like many others, couldn’t help but feel somewhat aggrieved. Here, after months of speculation, was the magical device Apple claimed would transform the mini computer market. Netbooks would be rendered pointless. The need for a folding device with separate keyboard and screen would soon be considered old fashioned and highly inefficient. Our lives would never be quite the same again. Etc. And there, in Jobs’ hands, was what looked like a a massive iPod touch. A really big iPhone. Without the phone bit. Or the camera. A huge, gigantic disappointment. To spare my credit card further pain, I spent the next few weeks explaining to everyone how pointless it was. And the device is, on face value, difficult to justify. I have a netbook. I have an iPhone. I have a MacBook Pro. Where would an iPad fit in? No matter how many times Jobs and his cronies banged on about the fun to be had ‘just picking it up off the coffee table to enjoy fantastic email’, I couldn’t think of a legitimate use of this £500 piece of techno eye candy. Then, a few days after the UK launch, I took the thirty minute journey to PC World in Milton Keynes to have a play with one. Within second of the home screen arranging itself I’d decided I required an iPad. So I bought one. A few days in, I feel qualified enough to write a few words on Apple’s new baby and I’ll start by reiterating that it really is a luxury device. No one on this planet needs an iPad. Neither will it replace your laptop. The lack of a real keyboard cements that fact. I’ll start with the screen, which is stunning. There was a whole lot of hokum about the fact it doesn’t possess a true widescreen aspect ratio and the fact that it’s surrounded by a fat black bezel, but as soon as you set your eyes on one, neither of those things matter. It is fabulous. The bezel, in fact, actually makes perfect sense as it gives your thumbs somewhere to rest whilst not obscuring the screen. Built quality is something else which strikes you; it feels sturdy, immaculately constructed and tough. Granted, I wouldn’t want to drop it, or frisbee it across to someone at the other side of the room, but it does feel like it’ll last. If the iPhone 4 is anything like this, we’re in for a treat. 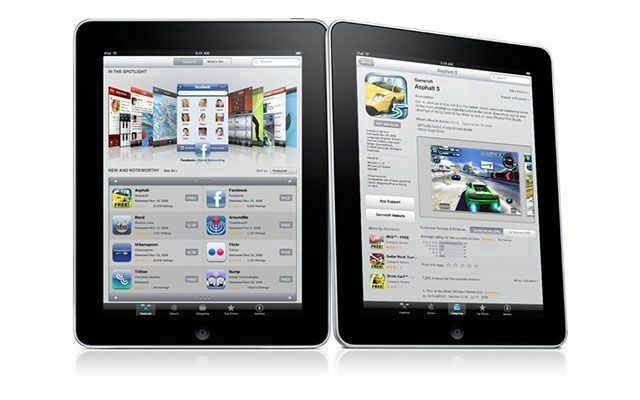 Apps, while expensive, are impressive and bring to light the benefit of the larger screen, when compared with the iPhone. It’s genuinely very exciting when you consider the kind of apps we’ll see from those clever and friendless enough to develop them. As a part time bedroom music producer, I can’t wait to see how this thing will complement my studio with synth and DAW controller apps. The keyboard. I hate the iPhone’s keyboard. I’ve found it’s got harder to use the longer I’ve had the phone, regularly hitting incorrect characters or the backspace button. iPad’s keyboard is obviously far bigger which makes it possible to type almost like you can on a ‘real’ keyboard. Not quite though. It’s still prone to errors and the lack of tactile feedback is one of the many reasons it won’t replace your laptop. Indeed, I wrote 50% of this blog on the iPad but had to resort to my MacBook after a while. Key to understanding and appreciating the iPad is realising that it is simply a device which makes ‘passing the internet around’, checking email, viewing photos and listening to music incredibly simple. The battery is astonishing. Apple quote 10 hours and I don’t doubt that. If anything, it might be a little more. Whatever it is, you can leave this thing anywhere about your house and pick it up when you need it, safe in the knowledge it isn’t going to die on you. Its also on, instantly, therefore you don’t have to wait for the OS to boot up before you check your email. Should you buy one? In short, only if you can afford it. My house is flooded with technology to the point where I simply don’t have time to use it all. The iPad has, however, made a bit of a mockery of my MacBook when it comes to web browsing and ‘pick up and play-ability’. It’s just incredibly handy to have around. If you can’t afford it at the moment and need to save, give it a few months and see what apps appear. Maybe even wait until the first hardware revision which should certainly include a camera, at the very least. Press Reader – download digital versions of newspapers – thousands are featured from all across the world and prices are reasonable. AccuWeather – pretty and informative weather app. Wikipanion – great Wikipedia app. Eurosport – far better than its iPhone equivalent. Early Edition – great RSS reader which formats RSS feeds in a newspaper-like format. Guardian Eyewitness – features one photo a day taken from professional news photographers. Also offers technical tips on how the shot was taken. WordPress – makes far more sense than the iPhone version and is a masterclass of simple design. Korg Electribe – iPad version of a classic groovebox. Much fun. IMDb – brilliant for film information and trailers. I’ve never owned anything but a Mac. It’s good to see an honest look at the iPad. I’ll take your advice and wait it out. It’s really not long before we junk everything we know as digital technology and move into something more monumental anyway.